Chinese Whispers exposes a hidden world, of almost unimaginable levels of exploitation and bullying, not in some far away place but right here in the UK. It is the world of the undocumented workers, of those who come to the UK from China and elsewhere, invariably at great expense and personal risk to themselves in order to provide for a better living for their families back home. Writer Hsiao-Hung Pai reveals the terrible conditions faced by most who work in this army of cheap labour, as well as the motives, the fears, hopes and the individual characters of some of those involved at the sharp end. She also puts forward some proposals about what can be done, in particular by the trade unions, to help this army of 700,000 people to escape from the clutches of the unscrupulous agencies, gang masters and other exploiters who make their lives so miserable. Like George Orwell, who worked in the kitchens of restaurants in London and Paris in the 1930s and who then joined the bands of travellers and tramps as they journeyed round the countryside, Hsiao-Hung Pai goes undercover, “to pretend to be one of these immigrants without official documents and desperate to earn money, and to see where it took me”. She finds work in the butchery and packing units of a large food processing plant in Norfolk, which serviced all the main supermarkets, and later, she takes up work at a leak farm in the Midlands, in a Chinese restaurant and even in a brothel as a housekeeper. She tells the stories, often sad and sometimes tragic, of her fellow workers: their difficulties in finding a job; of the £200 or so that they have to pay a labour provider for a placement of any kind; of the over-crowded rooms at their lodgings, with four or five to a room; of the endless hours of grinding back-breaking monotonous work interrupted only by a single half-hour break for six, sometimes seven days a week; of the complete lack of any training; of the constant fear of arrest and deportation; and above all of the pitiful wages, invariably less than the statutory minimum and often only about £3 an hour. And before they can make anything to send back to their families, they have to pay off their travel debts, which can amount to £20,000, owed to the Snakehead organisations who smuggled them in. If they are sacked, or more correctly, when they are sacked, usually for no good reason, they are lucky to get any back pay owed and they then they have to pay the £200 registration all over again. The workers, the “almost-invisibles” as the author calls them, live outside normal society, unable to access the health service or the trade unions. Even when they find themselves working alongside local British people, they have little contact and nothing in common as they are paid less and work much longer hours. “This is a completely sealed-off place”, one of them says. “Events pass us by”. Yet somehow they manage to maintain a sense of dignity, self-respect and even humour amongst themselves in their few moments of relaxation, in their caravans or their over-crowded rooms, cooking Chinese dumplings, chatting and helping each other. It is a moving but pitiless existence. The author was drawn into this wider investigation when she came upon the story of Zhang Guo-Hua, a poor farmer in Northeast China. With the changes driven by globalisation, he was becoming ever poorer and life was becoming very difficult for his family. At the age of 39 with two children to support, he took the plunge - enticed by the prospect of being paid ten times as much as it was possible to earn in China and by working in a “gentle, civilised country”. He ended up in Hartlepool, got a job through a labour provider, at a factory supplying parts to Samsung, for £1.80 an hour after tax. Over the next 6 months he literally worked himself to death. On the day of his death, he complained of acute headaches at work, and for the first time, he asked the supervisor for an extra break. “Wait till you finish work”, he was told, so he worked on, somehow managing to finish his shift. Plainly very ill, his housemates managed to get him to hospital, where he died three hours later. There was no autopsy, no inquest and no report into the unusual circumstances of Zhang's death. A few of his fellow workers went on a spontaneous strike, but were dismissed instantly. Mrs Zhang came over from China, but came up against a wall of silence and evasion from the factory managers desperate to keep the authorities from acting. She was offered £500 compensation, which was never paid, and “with no money, no knowledge of the law, no English and no legal status” she had to give up her efforts to find out why her husband had died. It was in fact only a painstaking and courageous 2-year research by the author that uncovered Zhang’s story and the conspiracy after his death. The Samsung factory had been set up with a grant from the government in 1995, but what remained hidden was the use of cheap migrant labour by the local factories that supplied it. All the while, Samsung was preparing to re-locate in Slovakia, where the labour was even cheaper. “Those glorious employment opportunities, praised by the Queen and Peter Mandelson”, Hsiao-Hung Pai writes, “were turned to dust. Samsung did not feel any obligation to return the £10.5 million they’d been awarded by the government….”. They moved. “Quietly, in the shadow of the great global conglomerate, Woo One (the suppliers of parts, where Zhang worked) in Hartlepool was closing down and relocating to Slovakia as well. Without noise or fuss, the Chinese and Korean workers were laid off and the factory was closed in March 2005. It was as easy as that to remove all evidence of past events”. It was the story of Zhang, together with the Morecombe Bay tragedy where 23 Chinese cocklers were drowned, and the deaths of 58 Chinese migrants in a lorry in Dover that lay behind Hsiao-Hung Pai's tenacity in exposing this underworld from within. She not only worked in this dark world and saw its rules and talked to its inmates, but later, when she had moved on, she followed up with interviews, and if necessary Freedom of Information notices, addressed to the employers concerned (who normally denied everything). As she concludes, these workers are all part of the global working class, “whose livelihoods in their home countries continue to be destroyed by global capitalism and its agents”. She quotes figures from the International Labour Organisation to show that the number of people living outside their country of origin has more than doubled to 175 million in the 25 years to 2000, and is likely to double again in the next 25 years. And of these an estimated 24 million worldwide are “illegal workers”. Most EU countries require temporary employment agencies to be licensed, but not Britain, and the New Labour government, typically, backed away from proposals to implement some protective rights to migrant workers last year as a result of pressure form the employers and the CBI. 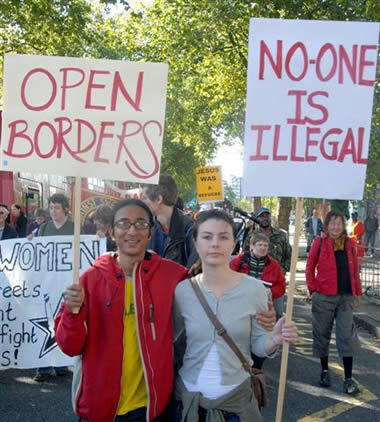 “The British economy thrives on this army of workers…..businesses survive on and make profits from their cheap flexible labour... Is it not time to ask what is Britain doing for the undocumented, as workers and as human beings?”, she asks. “By tightening controls and refusing to protect rights, the government maintains the workers illegality and their exploitation”, she writes. “The beneficiaries in all this are the government’s close allies: business. As first world countries like Britain keep their doors firmly shut, a world dominated by wealth and power is kept intact. Global workers….will continue to become illegalised on their journeys to lift themselves out of poverty”. A very rare instance of industrial action at a Chinese restaurant. A very good question, especially as the fate of these workers is now worsening with the influx of new (legal) immigrants from Eastern Europe and with new discriminatory laws. “There have been 20,000 enforcement raids by the police on work premises in the last year”, says Hsiao-Hing Pai. “Many workers are losing their jobs, even in remote places like Aberdeen, and a lot of Chinese restaurants are closing down”. The workers are frantically chasing about for new work “like ants in a hot wok”, as one of the characters she meets, says. Ren Xiang, an endearing, articulate older worker, whose story the author follows, summed up the feelings of many: “You work like a slave every day”, he said, “You contribute your cheap labour to this country. But when you’re ill how does this country treat you? I’ve seen the true face of the old capitalist country that I’d imagined to be civilised”.